To monitor ADAGIO’s position tracking, thanks to the generosity of Roy Barkas and OceanTracker, please click here. For the most recent 90 YOTREPS position reports please click here (courtesy of ShipTrak.org). At latitude 42 South the Tasmanian winter was fast approaching – it was definitely time to head north. It was the best of news that our fellow CYCT and RYCT member Gus Vans-Colina was keen to have a taste of catamaran passage-making. Gus is off-the-charts on all the desirable crew traits – a fun, reliable shipmate, super-experienced and an innovative fix-anything hand. It was our challenge to fit our Tasman passage into Gus’s availability window of 14 April to 27 May, which window was bookended by prepaid airline tickets. That meant we had to ensure that Gus would absolutely be back in Hobart by the 27th (without having to pay for first-class to get a seat home). Our hopes of departing on or right after April 14th were dashed at the end of March when our testing proved that the major-rebuild of our refrigeration compressor was unsuccessful. The German Bitzer compressor was still leaking refrigerant at the shaft seal. There were no replacements in Australia, so we had to organize shipping a new compressor from USA to Sydney to Hobart. And of course evacuate all the refrigerant, vacuum the system, tear everything apart one more time, then reverse the process to install the new Bitzer when it finally arrived. Five Aussie boat-bucks burned in that whole episode. The thumbnail at left shows ADAGIO’s OceanTracker.net page. 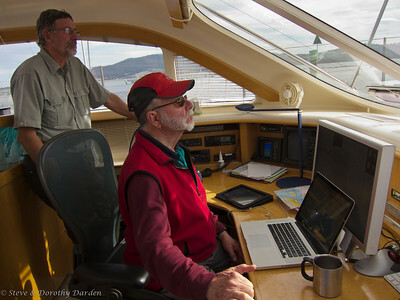 Roy Barkas lent an OceanTracker transmitter to ADAGIO and NEREIDA to test. ADAGIO for our South Pacific circuit Australia – New Caledonia – New Zealand. And NEREIDA so Jeanne Socrates could report her positions during the completion of her single-handed circumnavigation – the last Pacific run from Hobart to Victoria, Canada. This fully-automated position-reporting-monitoring solution was a delight to have aboard. We felt like 21st-century cruisers at last! ADAGIO’s extended family around the world continues to email us with their delight to discover exactly where we are within the last eight hours. OceanTracker reports our position automagically three times/day at 00Z, 08Z and 16Z. The Tasman Sea weather was clearly getting tricky, so we focused intently on the prospects for decent passage weather. In the Southern Winter the Tasman gets rowdy and increasingly difficult to forecast. Each week as we studied the weather models, we were seeing a “train” of LOWs from the Indian Ocean across the Tasman to NZ – with precious little space between them. Clearly we prefer to sail ADAGIO in the spaces between the LOW pressure systems. Equally clearly, tricky weather calls for professional weather routing. For twelve years Rick Shema has advised us on potentially risky passages. Our view is that professional weather expertise is a very high-return investment, returning much more value to us than our yacht insurance. Especially valuable is Rick’s enroute oversight as he knows where we are on the ocean in relation to subtle developments. Yes, we have access to GFS weather models enroute, but that is definitely not a substitute for a professional meteorologist appraising the ocean ahead of us at intervals that we have requested (e.g., two days). Rick’s skills are especially valuable as he knows how we sail ADAGIO, and ADAGIO’s capabilities in relation to wind and seas. April 19: We wrote to Rick “The GFS outlook for Monday departure looks a bit ‘complicated’ – difficult for us to assess the likelihood of misbehaving lows and squashy zones“. And on April 20th we wrote “After a little study of latest GFS I don’t see an attractive departure earlier than about end of week. That Tasman LOW doesn’t do anything good for us, unless we wanted to go direct to New Caledonia – which we could not due to friends joining us in NZ”. Upper level support for the Tasman LOW seemed to be cut off – the LOW was stuck right on our track to NZ, with another one approaching from the Southern Ocean. Your thoughts on the likely best days from Thursday 26th through Monday 30th? I just ran some routings on a Thursday AM departure, tracking northwest around the LOW. I was wondering if it was realistic to think of adapting tactics underway to the actual track of the LOW by changing course more to the NW if the LOW seems to be slowing down. Or if the HIGH approaching from the west looks likely to generate enough of a squash zone to encourage us to get further north of the rhumb. You like to live on the wild side! Maybe you can dodge the first low by heading Nerly, but it is unlikely to be able to avoid westerly gale south of the huge second low center (sub 975mb). Plus the unstable atmosphere providing inclement weather for most of the transit. You may be able to deal with the wind, but the waves will also be huge in the 6-7 meter range (significant waves) with a maximum of 10-14 m.
I’d be more comfortable waiting until the backside of the second low passes into the Tasman Sea, say about your Sunday. (…) That Southern ocean LOW that has been moving along 60S from 150E to 180 over the weekend has a northern semicircle of wind and swell that already extends as far north as 40S = southern North Island. As the Low makes its way further east on Monday is may throw northwards a secondary low as far as 45S 170W by wed 2 May—Along with SW swell reaching 9 occasionally 13 metres east of NZ . Avoid. Next Tasman low is likely to deepen off Sydney on Friday 4 May, as the High over NZ moves off. This Low should deepen and stay in the Tasman on weekend of 5/6 May, allowing a strong N to NE flow to form from New Caledonia to western NZ. Avoid. The following video illustrates our weather routing challenge. At this stage we were still on “Plan A” to sail direct from Hobart to Opua/Bay of Islands, then on to New Caledonia. We were assessing the risks of trying to squeeze Adagio into the short “gaps” between nastiness. In the simulation ADAGIO is chasing the first LOW striving not to get munched by the bigger LOW coming from behind us. Click the thumbnail to view a video of our routing simulation for a 26 April sailing. In this simulation, repeated every six hours, the Maxsea routing algorithm was using Adagio’s performance polars to estimate how much progress we could make on all possible paths from departure to arrival. Typically such travel-time-optimization means that Maxsea will send Adagio directly into the worst weather, because the algorithm “knows” from our polars that Adagio goes fastest in strong winds (and hence seas). As we were not racing, that is NOT what we want for a safe, relatively comfortable passage. To guide Maxsea away from the worst we located the waypoint shown at 35S 162E to force the Maxsea routing algorithm away from the time-optimal course. We wanted to be positioned enough north of the rhumb line to reduce our exposure to the large seas to be generated by the approaching big Southern Ocean LOW. At time-date 30 April in the video you will see Adagio’s boat icon scampering north of the rhumb line to stay out of the worst of the coming seas. Frustrating! Instead of sailing to NZ we were eating up Gus’s availability window assessing and rejecting predicted passage weather options. So, after three weeks of this game of low pressure chase-and-run we decided to shift to “Plan B”, to sail north instead of east. We will abandon the NZ stopover, sailing direct to New Caledonia, but hopefully with chance to enjoy Lord Howe Island on our way. Gus’s opportunity clock was ticking – we were down to about 24 days to put Gus where he can fly home to Hobart. We were very unhappy to contact our NZ shipmates Vanessa and Wayne to alert them that their New Caledonia holiday aboard ADAGIO was not going to happen this June. 0700 May 1: With Gus, Dorothy and Steve aboard, ADAGIO motored out of the RYCT, bound for Maria Island. We wanted to work our way quickly to the northern-most safe anchorage to wait for Bass Strait weather. Wineglass Bay would be great, but Schouten Passage is beautiful as well. We estimated our passage time to Eden at 42 to 56 hours. We were thinking we could go as soon as the winds backed from the NNW around to the West – possibly 1100 EST on Saturday the 5th. It would take us almost 24 hours to sail to northern Flinders Island, which is where a yacht begins to experience the real Bass Strait conditions. We wanted to get closer to Flinders because we were concerned about running out of wind north of Bass Strait. Fortunately Rick Shema was more concerned about that LOW possibly moving south in the Tasman Sea. Rick knows LOWs don’t always do what they are “supposed to”. Too risky. 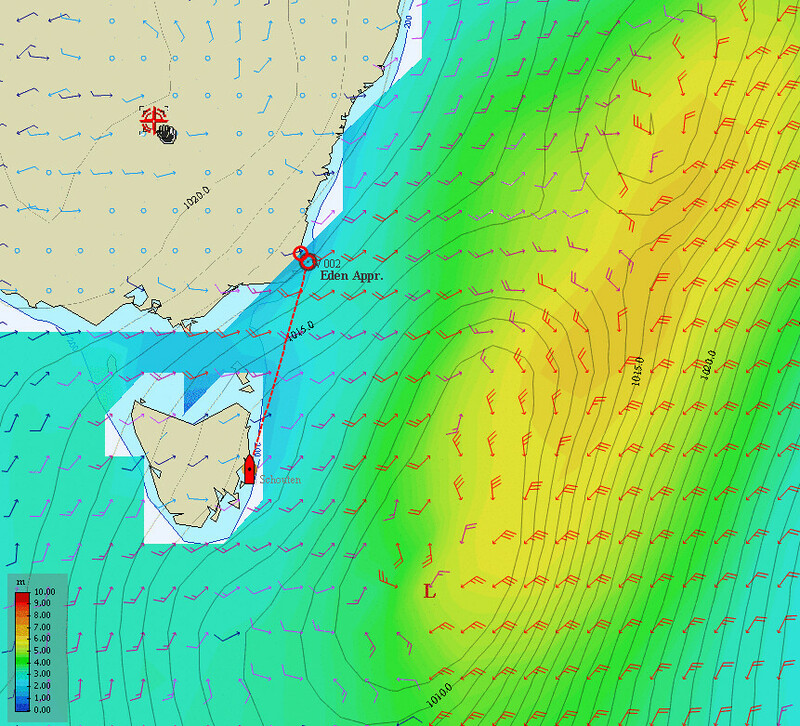 Bass Strait Werly winds 25-30kts gusts 35. Beam seas 2.5-3.5 m. How about making your way slowly northward tonight. Enter Bass Strait no earlier than Friday 0600Z [Friday afternoon 1600 EST for us]. Conditions are expected to abate to Werly 15-25 kts. May 4: On Friday morning via telecon, Rick Shema recommended that we wait until at least 1600 Saturday to depart for Eden. After further study of the progress of the East Coast Low then located north of Bass Strait, Rick said that it would make all the difference in the world if we waited a couple more days to depart. If the approaching East Coast Low tracked a bit more towards Bass Strait, then the conditions could turn nasty, and it would be worth the wait. So we waited, enjoying Freycinet in the Brian’s Corner anchorage. By Saturday 5 May the Bass Strait outlook was worsening a bit. We had only three weeks remaining to return Gus safely back to Hobart by the 27th. It was becoming clear that there was no way we were going in to Lord Howe Island – the western reef is a dangerous entry in the conditions estimated at 5 meter SW seas (see above snapshot showing the 5-7 M seas at LH). And once inside the reef it is not fun on a mooring and it is difficult to estimate when you can safely leave again. For Gus to get home from Eden would be a difficult trip, as the nearest Hobart flights are out of Melbourne, requiring a land journey. And for Gus, making yet another run up to Sydney is just retracing old many-traveled tracks. Fortunately Kate Hansford volunteered to drive from Hobart up to Coles Bay to give Gus a ride, so Steve & Gus commuted to the public wharf in ALLEGRO. We were very sad to loose Gus’s companionship. And as it turned out we made landfall in New Caledonia a week ahead of Gus’s departure deadline. But we could not have known that on 5 May. Summary: Departure recommendation remains at no earlier than 05/1800Z. The reason 1800Z is suggested as an ETD remains the concern about the low over Tasman Sea moving southward. At 05/00Z, the center will still be NNE of your present location and moving toward east of Hobart. The uncertainty factor is high enough that if the low moves more westward, then the center might pass close aboard your route, providing heavy rainshowers, squalls, gusty and shifty winds 40-50kts, etc. At 18Z the low center, if it moves as forecast, should be just about abeam of Bass Strait. There is still an outside chance of the low movement having a more westward component but that is unlikely if it tracks steady 180 deg Mag. So, the suggested departure time remains at the earliest 1800Z 05 May from where you are right now. Better yet and less risky depart 06/0000Z. Please see forecast table attached. 0500 May 6 [1800Z May 5]: We decided to depart for Eden on Rick’s earliest 05/1800Z recommendation. In the Australian timezone of UTC+11 hours, that meant pre-dawn Sunday morning, 6 May. So we unfurled our reacher in 15 knots of a SW wind and slight seas from astern. An enormous golden orb of a moon had just set. Several medium-sized albatross soared ahead, as the sky lightened to starboard. By 0651 hours we were abeam of Wineglass Bay and The Hazards. In 15 to 20 knots of wind speed, under full main and reacher, our boat speed was 9 to 10 knots throughout the morning. By afternoon the wind speed had decreased to 6 to 7 kn. 2052 May 6: We furled ADAGIO’S 1000 square foot mainsail because the Reef-Rite boom furler locking mechanism had released the sail from our first-reef setting. That means we could not be certain that we could reef down safely – and we definitely did not want a full mainsail where we were going. Until that problem was resolved ADAGIO could sail with full or no main; no reefs allowed. During the night the wind speed increased to 20 to 25 knots, so we sailed comfortably under jib alone – we had in mind Rick’s advice that six hours later into Bass Strait was less risky. We were on schedule, so we were not pressing the boat hard. During the night we passed another sail boat that was sailing slowly on a reciprocal course. There was no response to our hail on VHF radio. No doubt the occupants were asleep. They were a hazard to navigation, not standing watch. What would you have done if you had been aboard ADAGIO? Should we have attempted to rouse them? 0800 May 8: Landfall Twofold Bay, Eden, NSW. Our fifth Bass Strait crossing was as Rick had forecast – quite bumpy, with 2.5 to 3.5 meter seas slamming ADAGIO on the beam. Had we sailed 12 or 24 hours earlier we would probably have experienced the same horrible passage described to us in Eden by another boat that left Schouten Passage ahead of us – – 30 to 40 knots of wind with gusts to 60 and nasty seas. Ourselves, we had the uncomfortable irregular beam seas for most of the Strait, until the wind died as we neared Gabo Island. ADAGIO became a “salt layer cake”, but we looked forward to a fresh water wash down at the Eden wharf when we refueled. This entry was posted in 2012 Cruises by Steve Darden. Bookmark the permalink.